"Friends come back from their worship with a new sense of ordination, but not the ordination of human hands. Something has happened in the stillness that makes the heart more tender, more sensitive, more shocked by evil, more dedicated to ideals of life, and more eager to push back the skirts of darkness and to widen the area of light and love." As we enter open worship together, we sit down in silence and begin to quiet ourselves, in mind and body. We may start by praying, or we might meditate on a passage from the Bible, or we may hold up to God something that is happening in our lives. After a brief period of time, someone—most often the pastoral minister—will rise and deliver a prepared message. We don't think of this message as bearing any more authority than any other message, nor do we think of the speaker as an intermediary between the Meeting and God. But we've found it helpful in worship for at least one among us to have spent considerable time in prayer and study during the week on behalf of the Meeting, and to offer the fruits of that conversation with God as part of our worship. At its best, this message draws us closer together within the presence of God. Afterwards, we resume our silent, open, waiting worship. Sometimes it happens that, from within our quieted selves, we feel words rise within us. Some sentence or story comes to mind that won’t go away. We test these messages before we speak them: “Is this meant for me alone? Is it something for me to say to a friend, but not for all those gathered here? Is it for all of us?” In the end, the pressure to speak may almost push us to our feet. If this happens, we encourage you to speak the message to the whole Meeting. We value spoken ministry from members, attenders, and guests alike. Through such shared ministry we grow together in spirit and community. We also welcome requests for hymns. A few minutes before the end of worship, the person on the facing bench will welcome visitors and invite them to introduce themselves. We would love to know who you are, so we can welcome you personally, but please don't feel compelled to make yourself known if you are wary of attention. After visitors are acknowledged, we ask for joys and concerns followed by a brief silent “holding in the Light” of any spoken and unspoken concerns. 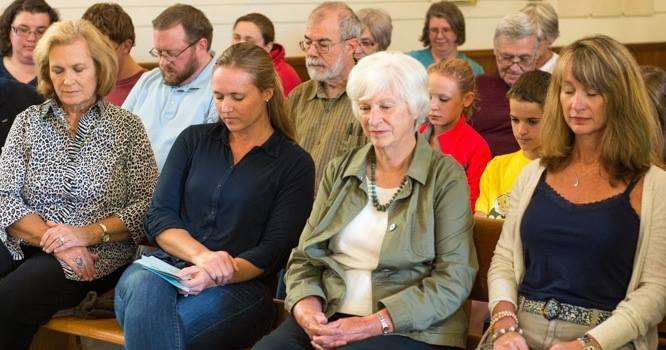 When “all hearts are clear,” worship ends, signaled by those on the facing bench shaking hands. At the rise of worship, we move to the Fireside Room for conversation and refreshments.